This Cat Heart Garden Stake (8.5"w x 14.5"H) will become a favorite garden decoration in any yard. A charming way to add some zeal to your garden or yard decor. 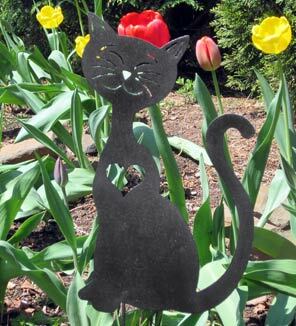 This Cat Heart garden stake will become a favorite in any yard. A charming way to add some fun to your garden or yard decor. From June Terry of Vienna, Virginia on 11/21/2011 . From Anonymous of Grafton, Wisconsin on 6/23/2011 .